I hope your week is off to a great start. By the time you read this post, I will be on a plane headed to Palm Beach and I cannot wait! I've never been, so if you have some suggestions on things we should do, be sure to let me know. Anyway, today I want to talk about waking up happy! Let me start off by saying I am NOT a morning person..at all. However, I do want to become a morning person and this year I am making steps toward becoming one. I know my days would be way more productive if I was up early in the morning. In fact, there are studies that show that people who wake up earlier in the morning are way more productive and just have more successful lives than those of us who like to sleep until our eyes pop open around 10am, haha. So funny story, Sunday night I woke up at 4am and I could not go back to sleep! It was storming outside which is what I think woke me up, but no matter what I did, I couldn't get back into my slumber. On the days like that when I just wake up extra early, I find that my day feels longer (obviously) and I feel like I just get more things done period. Nine times out of then, when I'm up early I eat breakfast, I effectively plan my day, and things just flow better. However, waking up early is HARD y'all. I just love sleep, and I know I'm not alone in that. Through my quest of finding my place in the early riser world, I have compiled a list of things that I believe make you an all around happier person in the morning, no matter what time you choose to wake up. So let's start there! Let's start with just waking up with a smile and ready for the day no matter what. Besides, each day that God gives us on this Earth is a blessing and through the bags under our eyes and sleep deprivation sometimes we tend forget that. I'm vowing to do better, how about you?! They don't say the early bird catches the worm for nothing! If a bird catches a worm, that means he has food for the day and ultimately guess what? That bird is going to be happy! No but seriously, waking up earlier increases your productivity and boosts your mood because you're not waking up in a panic rushing to get to work or where ever. Give yourself some time to breathe. This is something I am really trying to implement into my every day. I always have so much more energy when I eat breakfast. They say breakfast is the most important meal of the day and I KNOW I am not the only person who skips it. We have to do better! This is a big one. Waking up earlier will be so painful if you don't go to sleep at a decent time. For me since I'm a night owl, it's hard for me to just instantly go to sleep at night. I have to wind down before I can fall asleep and sometimes that winding down can take longer than I'd like! I'm working on getting to sleep quicker. This has helped me a lot! I have a Happy Planner, so I always review the following day the night before to see what tasks I need to take care over. I also plan my clothes out the night before if I have to be somewhere early. I have also prepared breakfast the night before as well before. Figure out what works for you, but the more you plan the night before, the better off you'll be! Now this DEFINITELY makes me SO happy. Every morning when we wake up, I look at my husband and smile and say 'Good Morning Sunshine'. He smiles back at me and says good morning and I truly feel like this positive energy as soon as you wake up does something to your mood for the day. We love it! Drinking lemon water in the morning before you consume anything else is SO good for you! Number one, lemon water has Vitamin C so it is a natural immune system booster. Also, it aids in digestion, gives you an energy boost, and just tastes really refreshing! 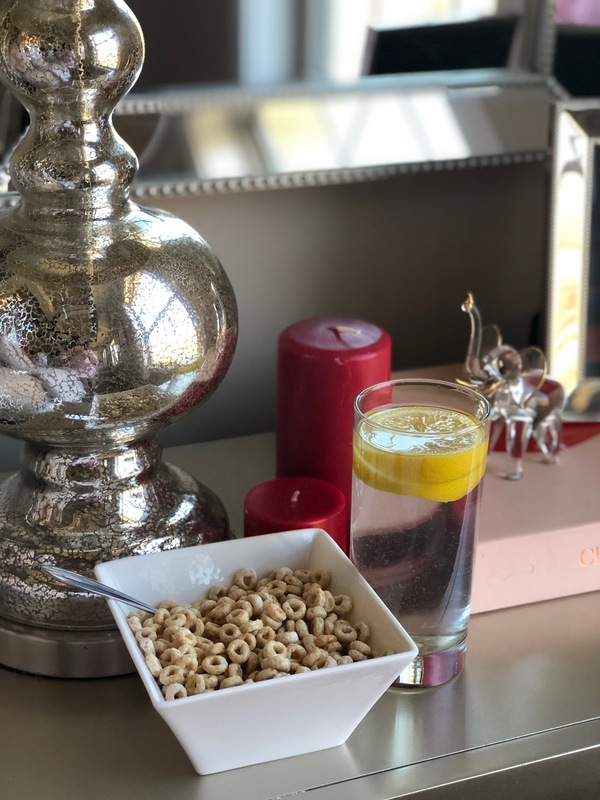 Try reaching for a glass of lemon water in the morning instead of or before your coffee. When you get out of bed in the morning, try some stretches to get your blood flowing. You can also try meditating! I haven't done that yet, but I do want to start because I've heard nothing but good things about the effects it has on your day overall. I love stretching in the mornings because it just feels like it is waking my body up for the day. So those are my tips for starting off your day happier and I hope some of these things work for you! At the end of the day, waking up is a gift we ALL often times take for granted and I believe we have to be happy simply because we are living another day. What are some things you do to ensure you wake up happy in the mornings? these are SUCH great tips! I am trying to be better about this and just started drinking lemon water every day. I love all of these tips! I love waking up to natural light too - it's so refreshing! Great tips that I will certainly apply to my busy life! I like to wake up early. I just need to get more sleep during the night and remember to wake up and stretch. I used to do the lemon water thing but haven't in a while. Love all these tips. I like to wake up early too. These are great tips and make a big difference! Love stretching and meditating when I start my day! I've definitely becoming a morning person since hitting my 30s. I just love how much better the rest of the day feels when you have time to not be rushed in the morning! I always try to write my to-do list the night before so that I know exactly what to prioritize the next day! I always start the morning off with breakfast and read a few pages of my book! Gosh I hate waking up early. But I'm in for it regardless when baby #2 arrives in June. Feeling happy and accomplished certainly is a dedicated choice. I love the getting ready for the day ahead the night before tip. I've started doing this recently myself and it totally helps! Yes to all of this! I need to do better and stretching in the am. That would definitely help me out! 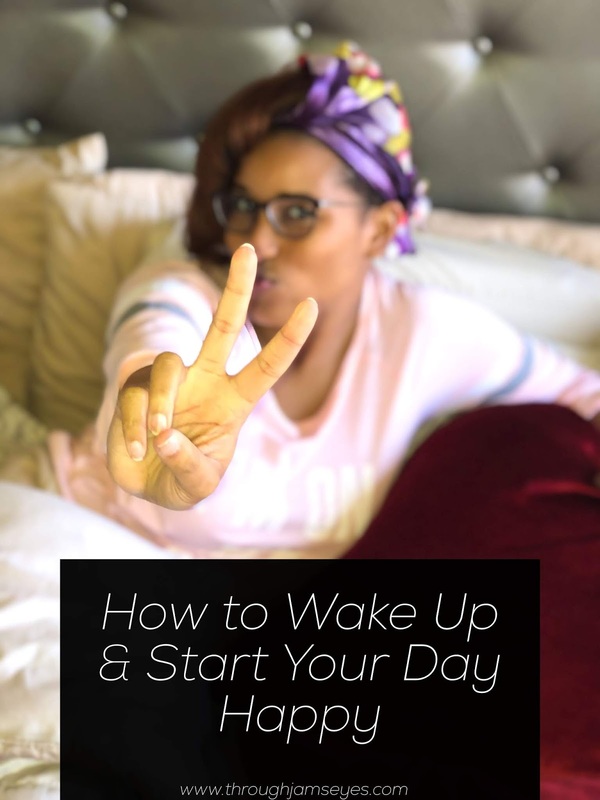 Such awesome tips - I am a morning person and do most of these already! Waking up earlier would definitely help me to feel less rushed .. but also LOVE my snooze button! haha! Great tips! Thanks for sharing your tips we already are incorporating some of them into our daily routine. I wake up so busy and need to stop and do a few of these. Thanks for the much-needed remi ders.